As natural and organic products continue to increase in popularity, there is growing demand among consumers for transparency regarding brands’ claims to natural, organic and sustainable products. Not all labels are what they appear to be and consumers have caught on. Now they seem to be looking for authentic and reliable brands that can back up their claims to quality product. 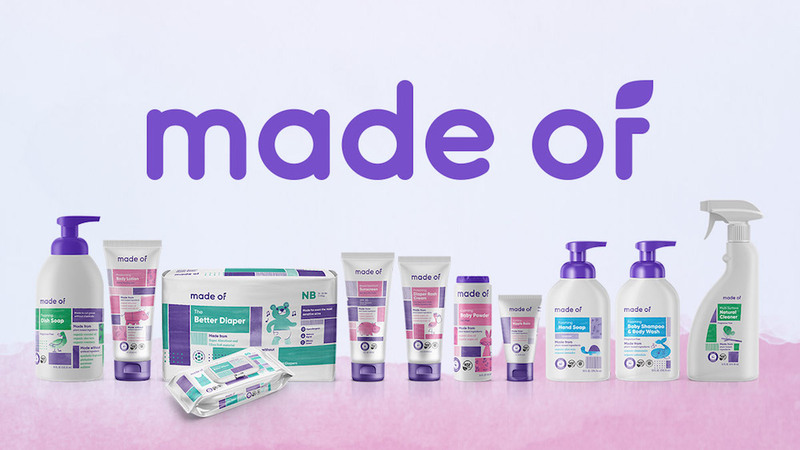 This is why MADE OF, a brand specializing in baby skincare and products, has dedicated itself to providing not only high-quality, ethically-sourced, organic goods, but also to offering consumers all of the information to prove its claims, helping ensure peace of mind. In an interview for a podcast, PSFK’s head of research and strategy Scott Lachut spoke to Igor Bekker, founder of MADE OF, about how his company maintains its commitment to total transparency and drives customer loyalty. Scott Lachut: Tell me a bit about yourself and how MADE OF came to be. Igor Bekker: I am a former retail exec. I would run directed consumer visual businesses and marketing analytics for major retailers. About a couple of years ago, through a big project we were working on, we stumbled on several interesting findings on consumer response to messaging and packaging. One thing led to another. Looking at the qualitative and quantitative data coming out of that research project, applying it to several categories in CPG, we saw some interesting opportunities, perhaps opportunities to‑be around transparency, manufacturing and sourcing as it all relates to the everyday products we use. This really inspired us to apply the data to several categories. We saw specifically in baby, a market demand from consumers for better products as the younger, millennial generation is becoming new parents. Their endeavor was to seek a better product, not only from a food standpoint but also in products that they use, such as skincare, beauty and cleaning products as well as what brands represent, what their claims are from marketing sense to communications to the experience. All that coupled together really inspired us to pioneer a venture we called Made Of, as well as pioneer a movement called Ultimate Transparency in manufacturing and sourcing as it relates to products we use every day. How does that transparency manifest in the marketing that you do on the site as well as through the product experience for consumers? What we found through research is that for new parents who are tech savvy, research savvy, really social butterflies spending a lot of time on social networks, their decision‑making is impacted by reviews, influencers, friends, family and bloggers. They really know what’s on the market, what is lacking in the market and what problems come with products. The decisions that they make really buckle down to the following: The most important thing for parents is efficacy. The product needs to work when they buy something because if your baby has a rash and their skin is chafing or bleeding, you call your pediatrician scared. The whole homeopathic medicine really goes out the window at that point. You really want to get something medicated. The second most important thing is what triggers the senses—touch and the smell, and sight, especially with female consumers. The product has to feel and smell good. The last is the natural aspect, the toxicity and health aspect of the product, meaning is it healthy, is it made sustainably and where was it made. No one really knows what they put on themselves, whether it’s sunscreen, shampoo or lip balm. No one really understands. They trust these brands and what they claim to be. We see in the market a lot of claims of being natural, nontoxic and safe as well as claims of transparency. What does it really mean, transparency? In the last several years, brands have been leveraging these savvy claims, and marketing them to be more than they really are. Is there a way that the claims are regulated? Taking a step back, in the States in this industry, in personal care the word organic and natural is owned by FDA. I say owned, and not regulated, because FDA does not carry regulation, doesn’t stipulate regulation around what organic is or shouldn’t be. They literally state that on their website. In food it’s regulated by USDA. In personal care in the States anyone can actually put anything in a bottle or tube and sell it and call it whatever they want to call it. You won’t be able to sell it to major majority retailers, because they’ll ask you for prove, but if it’s on your own direct‑to‑consumer website you can really do whatever you want to do. It’s a really Wild, Wild West. So within the direct‑to‑consumer space there’s a lot less regulation? Igor: Correct. What that really triggered is a wave of new brands popping up, even existing brands, taking note and slapping claims on their packaging as natural or nontoxic, when in reality that might not be necessarily the case. The result of that is consumers are deceived. In the last couple of years, because consumers are aware of brands deceiving them, people lost trust in what brands claim. How has MADE OF responded to this issue? That really resonated with us: Why is no one pioneering authenticity within personal care? There’s a lot of brands that claim natural. There’s a lot brands that claim transparency, but it’s just at the surface level. By surface level I mean disclosure of ingredients. It’s very hard to do. When you’re buying fruits and vegetables, it’s one ingredient, for example. When you’re buying a granola bar, there’s a couple of ingredients in there. It’s very easy more or less to trace the origin of the ingredients. In skin care where shampoo might have 10, 15 ingredients, lotion might have 10, 15 ingredients, it’s difficult to trace the origin. That’s really where the “A-ha” moment came to us as a brand. We believe that health and wellness stems from products we eat and the products we use or apply to the rest of our bodies, everyday products. That’s really the beginning of changing your lifestyle. To do that we believe that mandatory transparency has to come in the sourcing of ingredients, the manufacturing of the products, and how they’re tested. That’s really the foundation of this brand—transparency with everything we make. The biggest differentiation is our commitment to this transparency. What we’ve done is committed to bringing our customer into our product manufacturing lifecycle, which no one has ever done anywhere. Not in baby, not in adult. What that means is not only do we disclose the ingredients in our products, but also we show the consumer on our website the origin and the safety sheets, available for every single ingredient. Even if an ingredient is not organic per se or even if it was derived through a process, even if it was originally coconut and it was derived through a process, we still show you the process of how this ingredient originated. How else do you ensure quality of product and origin? We partner with a major, publicly traded lab, and we run a massive voluntary testing program on everything we make. We disclose to the consumer the actual test results. When we say something’s nut-free, gluten-free or even SPF30, how do you really know that the claim is true? How do you really know what’s on the packaging is true? We show it to the consumer. Everything we claim we substantiate through our test, and we show the actual test results. Additionally, we invite the customer to explore and see exactly where the product is manufactured. Everything we make, bottles, tubes, pumps, even the actual product is made in the United States. The only exception is a diaper. The diapers are not made in the United States, and the diapers are not organic. That’s really where the idea for the brand came about: Consumers really want to know what their products are made of and where the ingredients are originated, so we show it to them, and hence our brand name, Made Of. That’s really the mission of the brand. The byproduct of such transparency is partnering with factories throughout the United States, both in the packaging and formulation, with toxicologists and chemists, to formulate a really high‑performing product. Explain a bit about why you chose to develop baby-specific products with this mindset. We chose for it to be a baby product because we think parents are very diligent, and there’s a lot of scrutiny that goes on when choosing products for your baby. We started with the baby category, and our commitment to bring forward very simple formulations and independently certify it is the second differentiator. We’re the first and only brand to have such a wide assortment in everything baby, encompassing four categories: bath and body, skin care, cleaning and diapering that’s independently certified to be personal care organic standard, NSF in this case. The only exception is the diaper. The reason we didn’t want to get the diaper organic certified is there is an efficacy issue with organic diapers. They’re not high performance. It’s in the works. The technology’s just not there yet. At the end of the day the product has to work. How did having transparency as the guiding principle impact the development and design of the products that you’ve launched into the marketplace? It was very difficult initially. We don’t want to be perceived as a baby shampoo manufacturer or lotion manufacturer. We really are trying to convey the message that we’re a supply chain that prides itself on transparency manufacturing. Having that as a foundation we can manufacture and expand into vertical and horizontal categories. We can manufacture anything. Building that supply chain was what took so long because the manufacturing process, especially in the United States, is dated. It’s very difficult to put the pieces together because it’s a lot of moving parts. Our ingredients grow globally. Aloe vera doesn’t grow well in Florida. We source ingredients globally from Europe to Morocco to California, then bring them into the United States with the record of origin which is according to USDA guidelines. Our organic ingredients and nonorganic ingredients are guided through the process of USDA and LT. Both finding the factories that are certified through the USDA organic standards and USDA good manufacturing practices across such vast portfolio categories was very hard to do. The resin that’s used in the recyclable EGP, making sure how the resin is originated, that it doesn’t have BPA and BPS chemicals in it, was very difficult to find. Aggregating that supply chain together focused on only making products in the United States was really the big mission. It was a difficult endeavor that we achieved. Now that we have the supply chain, we decide what to produce according to what consumers demand, and we started with baby. Not only are you creating this product that is primarily organic and fully transparent, buy you’re trying to keep the cost down. Cost is a very interesting challenge. It is very expensive to manufacture a good, high‑performing, organic, clean product, especially in the States. If you look at the marketplace today, and it’s sad but true, a really good organic natural product is more of a privilege, unfortunately, because it is very expensive. It’s not mainstream. It’s not available to the majority of the public. We believe that the great, organic, everyday product is a right and not a privilege. Building the supply chain and scaling to mass production to the supply chain will allow us to bring our quote down, hence lowering our pricing, making the product available to more consumers, in the United States and also other countries. How are you marketing this to consumers? How are people finding out about your brand? We have two distribution strategies. One, as you’ve said, is direct-to-consumer. The other is focused on retail. We believe this product deserves to be on the shelf at retail. We are in the works of building out our retail distribution plans. We want to put the product into retailers, starting out with those retailers that have the same customers, that have the affinity to a more natural organic health and wellness lifestyle, and then expanding from there. We’re working with retailers and brokers, bringing the product to their attention regarding what the consumer demand is. The other side is direct-to-consumer. There’s a lot of storytelling, which is the challenge here because you have very limited real state on packaging, even on site. The amount of time that consumers spend on looking at a package, reading the website, is really minuscule. Especially with so much content that’s syndicated today across the Web and all the social media, consumers’ attention spans and attention to detail is almost nonexistent. Really being snappy about what’s the most important primary message is important. Educating our consumer around transparency is very important. We’re also leveraging communities of bloggers—some want to call them influencers. I don’t like to use the word influencers—they’re really mom bloggers, real people, who talk about what’s important to them and share it with their following, leveraging social platforms. Being authentic in messaging is really important. That’s really our goal: looking at building relationships with customers and communities that have those customers around what’s important in the everyday product and why it’s important to look for authentic, transparent brand. That’s our marketing message right now, followed by, obviously, traditional paid efforts. What has been the feedback that you’ve gotten from consumers thus far? Is any of that feedback influencing how you’re moving forward with the brand? We used that data in building the product. Let me get specific here. Part of the ethos in the design aspect and really the nature of the brand was that the founders will not have an opinion as it relates to how this product looks, feels and works because it’s biased. To alleviate that personal bias and subjective opinion, we really relied on data coming from parents. If you look at our product, even our packaging, the feedback that we received from ingredients all the way to the look and feel really came from parents. What’s an example of how you’ve collected feedback? We ran a big study of Facebook. We asked parents, “Which specific animal resonates with which product?” This was open forum. This wasn’t multiple choice. We got 5,000 responses. Parents would tell us, “A hippo in the sun all day correlates with sunscreen.” We did this all day long. Aggregating their data and writing an analysis really helped us build how the product looks and how the product is manufactured, and what goes into the product. We aggregated what specific ingredients or lack of ingredients, what certifications the parents recognize or don’t recognize, what’s important to them, what’s not important to them. That’s how we built the product—really leveraging feedback from our consumers and building the product that they want. They want to use it themselves, even on their babies—that was the foundation of how the designing worked. You mentioned obviously that you are focused on the baby space and thinking about moving into physical retail as well. What are you going to be focusing on in terms of building the brand for the next 12 to 24 months? Really building out direct‑to‑consumer presence. Getting customers involved in the next wave of product. Focused on putting the product nationally into retail shelves is going to be the next 12 to 24 months. It’s going to keep us very busy. Introducing some unique scents into the assortment of the product. Perhaps, moving into some product extension within the baby category. Really, we don’t want to grow too fast and lose sight of what consumers want. The next 12 months or so is going to be important to see what other products resonate with our customers, what their feedback is, both from the usage of the product, how it smells, how it feels, the packaging and continue to innovate. The big focus is on design. The product, it has to be a good product, but also be a beautiful product where customers are wanting to use it. Continuing to iterate, always focusing on innovation. This is how we build our team here: think of it like little incubators, small groups of teams coming up with innovative things and testing them. Testing, testing, testing, not letting it die, seeing if it’s going to work with customers and continue to innovate. For more from Igor, listen to PSFK’s podcast. For more about how brands like MADE OF are creating natural skincare offerings that appeal to health and environmentally-conscious consumers, as well as generating customer loyalty and confidence by ensuring the quality of their products, see PSFK’s report A Natural Approach To Baby Skincare.